Educate. Empower. Enhance and engage. 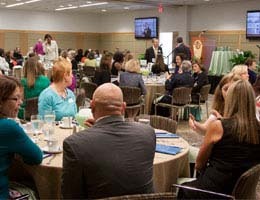 That has been this year’s theme of the Women’s Center, which celebrated it 12th annual Women’s Leadership Breakfast on May 8 at the Portsmouth Campus Student Center. Shannon Kendrick and Angelia Williams. 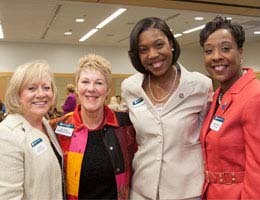 Tidewater Community College President Edna Baehre-Kolovani opened the morning welcoming special guests who included Kenneth Wright, mayor of Portsmouth; Elizabeth Psimas, Portsmouth councilwoman; Theresa Whibley, Norfolk councilwoman; Angelia Williams, vice mayor of Norfolk; and Shannon Kendrick, congressional district director for Rep. Scott Rigell. “The Women’s Center continues to serve students through its unique and specialized services that educate, empower, enhance and engage them,” Baehre-Kolovani noted. During the 2013-14 school year, the Women’s Center served 2,140 students with academic, career and personal support, and 2,862 students participated in educational programs and offerings. Sixty-three students received more than $12,000 of donated emergency assistance funds determined to be critical by Women’s Center staff for the retention of these students. The Women’s Center successfully piloted a “virtual food pantry,” helping 45 students in need with dining expenses by putting $25 on student ID cards. Wass thanked champion Women’s Center sponsor Dominion Virginia Power for its continued support. Because of the assistance of Dominion Virginia Power and sponsors Pender & Coward, Pilot Media, Dollar Tree, Prevailance, Inc., and Noah Enterprises, Inc., N.E.W.S. has raised more than $16,000 to support the Women’s Center’s mission in the 2014-15 academic year. Keynote speaker Barbara Hamm Lee, host of WHRO’s “Another View,” encouraged those in attendance to engage in lifelong learning and give back to their communities. Hamm Lee shared her story of adapting to various life and career changes to reach professional success. Ivory Warren, head of TCC’s human services program and an active member of N.E.W.S., presented the Dr. Alexsandria Manrov STEM awards to students Melissa Falvy, Stacy Kelley and Crystal Lorenz. Named after the TCC biology professor, the awards were made possible by a gift to the Women’s Center. They recognize the academic achievements of female students pursuing careers in science, technology, engineering or mathematics. Falvy, graduating this week, plans to transfer to Virginia Tech this fall and work toward her bachelor’s in mechanical engineering. Kelley, who holds a 4.0 GPA, will graduate from TCC in December and plans to become a marine biologist. Lorenz, who will also graduate from TCC in December, plans a career in computer science. Engineering student Lililya Zeigler also received the Manrov award, but was not in attendance. Student Melanie Matthews received the Mary Pat Liggio Award, named after the founding coordinator of the Women’s Center. Matthews is a member of the Women’s Center’s Women Inspiring Self-Empowerment Leadership Development Program, Phi Theta Kappa and secretary of the Human Services club. Matthews is an intern at the Help and Rescue Shelter in Portsmouth and recently organized a group of teenagers from the Southside Boys and Girls Club to tour the Norfolk Campus. Matthews will transfer to Norfolk State University to work toward her bachelor’s in social work.